No glue, self-adhesive, no residue, clean and bright, no hidden trouble. Perfect solution for privacy, also can decorate your window glass. Package Includes: 1 x Window Film With Installation Manual. 7. Dry off your window with a rag entirely, cut the excessive edge carefully. Paste edge carefully. Done. A clean and smooth glass surface without any dust, fiber or any kind of texture is needed. The transparent back cover must be peeled off; otherwise, the film will fall off when the water is dry. Do not apply to the window frame. Do not apply to outside window or windows with cracks. Cut off excessive edges after application if needed. More efficient in teamwork, a product of energy saving and environmental protection. Affix tape on both sides to remove the window film from backing film. The film may be a little tough and its adhesive effect will be impacted in winter. Solution: use hair dryer or warm water to soft it. ( Heat resistance is under 176℉). Q: Why there is bubbles inside? A: Because the water is not clean out entirely. After you position the film, please smooth out the film with squeegee, make the air bubbles and water out completely. Eco-Friendly Vinyl materials Premium Window Film, No harmful substance, No chemical smell, Let You Enjoy Healthy Life. PRIVACY And DECORATIVE: Provides Privacy and Allows the Lights in. Privacy Level :★★★★☆ Private Window Films. Let you enjoy your life easily and safely. Beautiful Flower patterns let glass look like art. ENERGY SAVING: Retain Heat in Winter Comfort and Keep It out in Summer. Control Heat and Block Out 98% of UV Rays. NO ADHESIVES & EASY REMOVAL: Glue Free Design Cuts down Chemical Release Drastically, Applies in Minutes, Leaving No Residue after Removal and the Film Can Even Be Used Again. 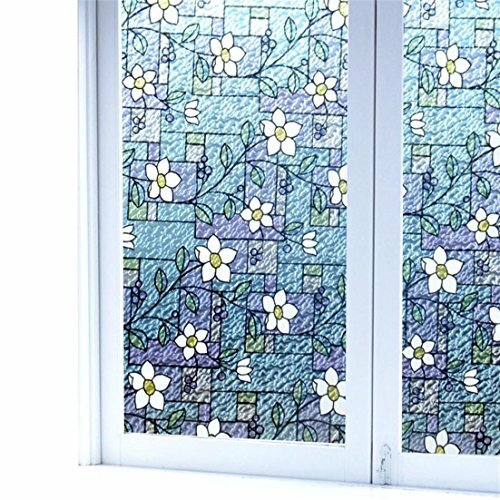 This Stained Glass Window Film can use used in kitchen, dining room,bedroom,kids room, bathroom, glass, door, household glass, office door, window, balcony window and more smooth glass. View More In Kids' Room Décor. If you have any questions about this product by Viclover, contact us by completing and submitting the form below. If you are looking for a specif part number, please include it with your message. WindowPix 42x42 Inch Decorative Static Cling Window Film Magical Tuscan Sunrise . Printed on Clear for Window Glass panels. UV protection, Energy Saving. Bloss Window Film Privacy Non-Adhesive Static Cling Decorative Window Sticker Film Static Cling for Door Kitchen Bedroom Office Meeting Room Frosted Stripe 17.7" x 78.7"
RABBITGOO Privacy Window Films Static Decorative Film Non-Adhesive Heat Control Anti UV 35.4In. by 78.7In.